Fury whipped up a sizable market share for the apocalyptic series' return. You can now make the game play more like previous titles. It's been six years since the last game, so it's a good time to refresh your memory. You can look forward to some unique DLC after Darksiders launches in November. Look out, Sloth! Kyle's coming for you in today's NGT. Fury's Force Hollow form is useful against the Seven Deadly Sins. The trailer also hints at what Fury is up against in the third Darksiders. THQ Nordic has revealed Darksiders III's composer and offered up a track from the game for your listening pleasure. We got a chance to play the demo THQ Nordic will be bringing to Gamescom before the show begins next week. 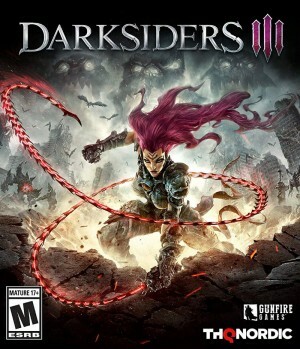 The third game in the Darksiders series releases this year with a special edition.